Many of us don’t realize what we’re destined for in our lifetimes but what we do know is that what we’re doing currently in our lives just isn’t cutting it. It can feel like being stuck in quicksand when you want to go out and achieve so much more but yet you just can’t seem to make a move. You’re so trapped in your mundane boring routine and just want to get out. The truth is, nothing can change until you decide to change it. Nobody else can change it for you. If you hate your job or despise your boss, you need to find another job. If you hate your relationships and friendships, you need to go out and meet new people and build new relationships and friendships. If you hate the way you look, you need to change your diet and start a workout program. For all of life’s problems, there are solutions. The majority of us don’t have that inner motivation to really go out and get what you want. But even worse, we all feel we are destined for something more and aren’t sure what it might be. What is your true calling? What is your destiny? In this 10 part video course, you will learn more about who you are, what you want and how to go about achieving it. You’ll discover how to find your true calling and passion, how to set goals, how to rid yourself of everything negative that’s holding you back and much more. 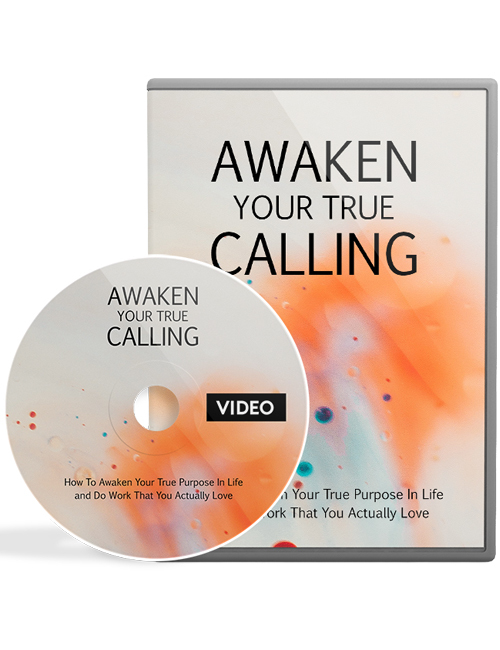 You can also get the Awaken Your True Calling ebook with this course. Grab it all now.